Volkswagen has launched a Connect Edition of the Vento/Polo/Ameo in the country. Available at no extra cost, this special edition comes with a Bluetooth dongle which can be connected to the OBD port of the car. It collects various drive-related information like fuel consumption, trip tracking and location service which can be accessed via an app by the user. Alongside this tech update, there are also a few cosmetic updates like a new blue paint scheme, carbon black finish on ORVMs and new alloy wheels. 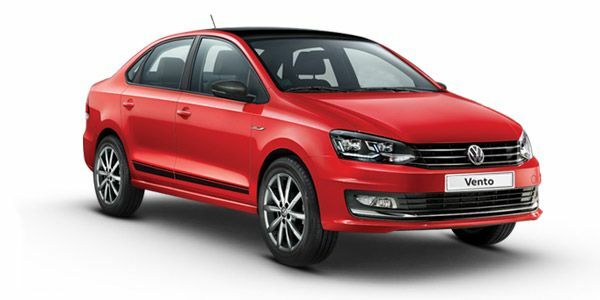 Volkswagen Vento prices start at Rs. 8.65 lakh for petrol and goes upto Rs. 12.99 lakh. The prices of Vento diesel variants start at Rs. 9.47 lakh and the top-end diesel is priced at Rs. 14.34 lakh. Volkswagen Vento is available in 10 variants and 8 colours. The claimed ARAI mileage for the Volkswagen Vento petrol is 18 kmpl, and for the Volkswagen Vento diesel is 21 kmpl. Well built inside-out; even though it is the oldest car in its class, it still is one of the best built cars in its class, making it feel more premium than its price. Understated design may appeal to some. Diesel engine is powerful and efficient, especially when paired to the DSG dual-clutch gearbox. Ride and handling setup feels well balanced. Is well equipped with features like rain-sensing wipers, touchscreen infotainment system, cruise control etc. 1.2-litre TSI petrol is not efficient; 1.6-litre MPI motor feels lazy. Diesel engine is quite loud. Ride not as comfortable over broke surfaces. Service costs can be high if repairs need to be done. Service network not as widespread as competitors like Maruti and Hyundai. One of the older cars in its class. The Volkswagen Vento makes a good case for itself as the perfect car for those looking for a sedan with great build, European car-like ride and handling characteristics, good features and an efficient diesel engine. Buying any of the four diesel AT variants of the Vento make the most sense. Q. Could you please suggest, which one better option - Honda City VX petrol or Vento 1.5 TDI Highline? Q. How is the vento maintenance? Q. Which is a good car to drive, Vento petrol automatic or Aspire diesel manual? Q. DSG gear box is reliable or not? The Volkswagen Vento is the second sub-Rs-15-lakh sedan the company sells in the country and slots in above the Ameo sub-4-metre sedan. It was first introduced in the country in 2010 and has been on sale ever since with small changes made from time to time. It was given a refresh in April 2017 where it received features like all-LED headlamps. The Volkswagen Vento continues to be based on the same platform as the Polo hatchback, and considering the company is not planning to launch new MQB-based products here anytime soon, will continue on soldiering till it becomes too old to be competitive in the market. Most recently, Volkswagen has added a cosmetic ‘Sport’ variant to the Vento lineup to make it more appealing. The Volkswagen Vento now features all-LED headlamps, LED taillamps and new alloy wheels, but on a very familiar body shape. It has grown in length and width compared to the car first launched in 2010, but that is hard to decipher if you glance at it. If you choose the Sport variant, you can also choose from a new red paint, gloss black roof and spoiler, carbon-fibre ORVM covers and new alloy wheels. The Volkswagen Vento features a understated cabin with a dual-tone black-and-beige theme. The centre console is angled towards the driver for that sporty feel, with the flat-bottom steering also adding to that theme. The design overall is very basic but its cleanliness makes it feel premium. It can seat five adults at a squeeze and four adults very comfortably. Rear A/C vents are offered and make the cabin more comfortable to be in. The Volkswagen Vento is offered with four different engine-transmission combinations. The petrol engines include a 1.6-litre, 4-cylinder, naturally aspirated engine developing 77PS/153Nm and is paired to 5-speed manual transmission, while a 1.2-litre, 4-cylinder, turbocharged engine is also available paired only to a 7-speed DSG. A diesel motor can also be had - a 1.5-litre, 4-cylinder, turbocharged unit which can be paired with either a 5-speed manual or a 7-speed DSG. Power is sent to the front wheels, with the AT variants featuring traction control as an added safety equipment. The Volkswagen Vento has competition from Europe, Japan and Korea. Fiat Linea: The Italian offering is the other older car in the segment, once known for its simple but beautiful design, good build quality and great handling. While the build quality is still good, the Linea suffers from old-school features, inadequate space, complaint of spare parts costs and a small service network. Maruti Suzuki Ciaz: One the best selling cars in its segment, the Ciaz is sold through the company’s premium Nexa sales network. The Ciaz may not be a looker but it has the advantage of offering one of the most spacious cabins in the segment, good features, a very efficient diesel engine and is backed by Maruti’s large service network. The 1.3-litre diesel motor may not be powerful, but is very efficient thanks to the company’s SmartHybrid mild-hybrid system. Honda City: Honda’s midsize premium sedan was given a comprehensive refresh in 2017 which raised its premiumness through the roof with features like All-LED lights, new 16-inch alloy wheels and refreshed interiors with a spacious rear cabin. The 1.5-litre diesel and petrol engines are both powerful and efficient, but not in the same league as Maruti in terms of efficiency. Handling is good. though. Hyundai Verna: The new-gen Hyundai Verna has lost the curvy ‘Fluidic’ theme from its predecessor for a more grown up look. It is 65mm longer with a 30mm longer wheelbase than before, and in typical Hyundai fashion, is loaded to the gills with features. The Verna loses out on rear cabin space, which is a big negative in this segment. Skoda Rapid: Refreshed in early 2017, the Skoda Rapid is the Vento with a Czech twist. It has the same positives and negatives as the Vento but in a different looking body. Though its age is starting to show, the Vento is still one of the best cars to buy in its segment especially if you favour quality and premiumness. All the three cars get a new colour, minor updates and an "intelligent connected assistance system"
Its a car worth driving. Very safe on highway. Wonderful driving experience, excellent work on the basic features.